Our office area is located in the Trombly Ltd region on the Trombly Ltd grid, at grid.tromblyltd.com:9100. You can teleport in directly from any hypergrid-enabled region on any OpenSim based grid by entering grid.tromblyltd.com:9100 into the search box of your Map window. Note: if you are teleporting in from a southern grid, such as ReactionGrid or FrancoGrid, you may need to take a couple of extra jumps until the teleport distance bug is fixed. 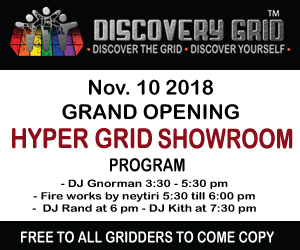 For example, you can teleport first to ReactionGrid’s southern hypergrid gateway, at 71.6.200.154:9009:HG Gateway 1, and the jump to HG Gateway 2 and then to grid.tromblyltd.com:9100. Create a free ReactionGrid account. ReactionGrid is a medium-sized grid focused on business and education users, and has the nicest avatar choice process for new users. 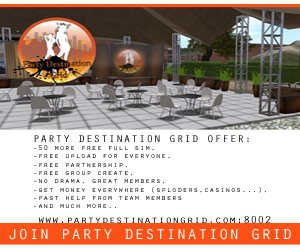 You can use this account to travel to other OpenSim grids, as well. Run the Hippo browser, and sign in with your name and password. 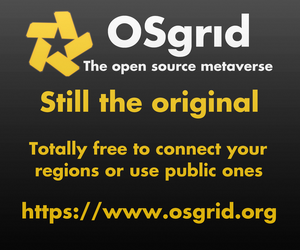 If you’re using an OSGrid account, you’ll be logged in automatically. If you’re using a ReactionGrid account, you will need to set your starting grid. Click on the “Grids” button and pick ReactionGrid from the list. If it’s not on the list, click the “add” button and enter http://gsquared.info:8008/ into the Login URI line., then “Get Grid Info” and “OK” after everything is filled in. More information here. From OSGrid, teleport to the Hypergrid Business region. (Click on the Map tab at the bottom left, and enter Hypergrid Business into the search field, then click “Teleport.”) At Hypergrid Business, you can wander around our starport (currently under construction — forgive the dust) or follow the signs to “Enterprise Grids” and walk through the stargate marked Trombly Ltd.
From ReactionGrid, teleport to the HG Gateway 1 region. (Click on the Map tab at the bottom left, and enter HG Gateway 1 into the search field, then click “Teleport.”) From there, teleport to the HG Gateway 1 region. (You have to do it in two jumps — there is a bug that doesn’t allow long-distance teleports yet.) At HG Gateway 2, click on map again and enter grid.tromblyltd.com:9000:Trombly Ltd into the search box.